Click on "Roman Empire" then "Printable Activities" for a timeline and a quiz. 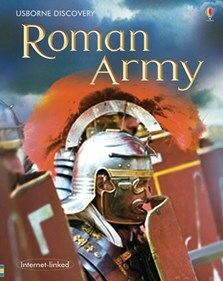 Discover what made the Roman Army such a force to be reckoned with. Find out how legionaries were trained and how the army was organized, and the weapons, armour and tactics of the world’s first superpower. Illustrated with dramatic photographs, maps, diagrams of battle plans and virtual reality models. Ideal for school libraries, home learning and classroom use. (Usborne Discovery series) are extraordinarily good value at £4.99, combining exciting and dynamic visual images with clear and informative text. The internet-linked element allows children to view a range of carefully selected recommended websites, providing sound, animation, video clips and further detail on each subject. Ideally designed to support independent investigation for homework and projects.